Sixteen leading influencers have pledged to improve the way they label their social posts in an initiative from the Competition & Markets Authority. Under consumer protection law, influencers are required to state clearly if they have received payment for products they endorse – either in money, gifts or the loan of products. But, in many cases, they fail to do so, either by completely failing to identify paid posts, or for not doing so sufficiently clearly. The CMA has now signed up some of the most widely followed figures, including Alexa Chung, Ellie Goulding and Rita Ora, to publicly commit to follow the rules – a move that a spokesperson for the body said was intended to act as an example for other influencers. The 16 figures are the first wave of influencers to be approached by the CMA and were targeted based on the size of their following and the fact that they had previously published posts that were in breach of the rules. They have all now made a formal commitment to adhere to the rules. The CMA is approaching more influencers with a view to securing the same commitment. In cases where an influencer fails to comply with the requirement to identify payment, the CMA is able to take action including applying for a court order, which could eventually lead to a fine or even imprisonment. The CMA is working with the Advertising Standards Authority on the problem, but the posts in question do not neessarily come under the ASA’s remit; for a social post to be considered an ad, its content must be controlled by the brand, as well as being paid for. "You should be able to tell as soon as you look at a post if there is some form of payment or reward involved, so you can decide whether something is really worth spending your hard-earned money on. "The enforcement action taken by the CMA has seen a number of social media stars pledge to be more transparent when posting online. It also sends a clear message to all influencers, brands and businesses that they must be open and clear with their followers. We will also continue our work to secure more improvement in this space." The 16 names who have pledged to follow the rules are: Chung, Mario Falcone, Alexandra "Binky" Felstead, Goulding, Holly Hagan, Rosie Huntington-Whiteley, Michelle Keegan, Iskra Lawrence, Mackintosh, Megan McKenna, Chloe Sims, Zoe "Zoella" Sugg, Louise Thompson, Dina Torkia, Ora and James Chapman. Commenting on the news, Katy Leeson, managing director of Social Chain, said: "With so much confusion about the quality of engagement or authenticity of endorsement, digital influencers need to step up and do their part in bringing trust back to the influencer marketing industry – and this is a positive step in the right direction. "Despite a dip in trust, influencer channels remain Gen Z’s preferred way to view brand-led content, and youth demographics, in particular, remain intrinsically loyal to social media stars and continue to buy into what they promote. 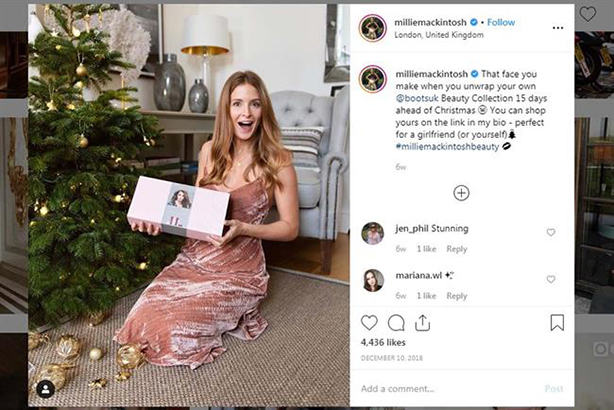 "Contrary to popular belief, marking posts as adverts doesn’t hinder their performance, provided the brand partnership is authentic and the content is relevant to the influencer’s audience. Social media marketers need to be getting constantly smarter in their use of influencers; people switch on to social media to be entertained, so simple promos and product posts from brands tend to get lost in the noise. Influencers are much better-placed to make an impact."